Food is medicine. How we eat is emotionally healing. 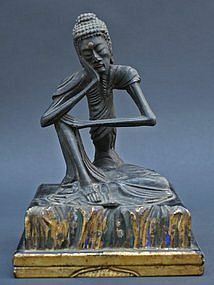 Buddha Nurture is not in junk/crutch eating. The body is part of the mind. It effects how we think. Just as how we think effects our brain, body and environment. I am growing some herbs this year, so oregano and fennel might be the flavouring. When at monasteries, including Christian, food is prayer. Haha! I just put together a Chicken Florentine for dinner. It was a special request from my younger son who is a bit sore from orthodontic work this morning. I was burning sandalwood incense at the time, so its all good with the chicken. In all seriousness though, I do love preparing quality food for my family. I feel that vegan and vegetarian food is for many an expression of ahimsa. Bravo. Like @Shak I am shamelessly omnivorous. My feeling is the ideal that @federica achieves. I sense great love for her vegetarian food. I must admit that a certain amount of sweets are among my vices... i’ve lived without sugar for sometime but couldn’t maintain it, what is life without a few pleasures? just random thoughts....everything is buddha? if buddha is defined as accomidating.siddhartha says seeing me is seeing dharma.what was his insight?his body is not separate from dharma--and to what was dharma to him?to serve or accomidate. a broader view.the earth serve .the earth provide. thank you dharma earth. Vegans are sort of the Jehova witnesses of new age circles. As a rule, I do prefer vegetarian food and have been trying vegan replacements for animal-origin staples. But all vegan milks are still a rip off. One look at the labels, and we find less than 5 or 10% rice, almond, cashew, you name it. And new research suggests that soy is not really a healthy option to eat in huge amounts. I love turmeric and among other uses, I begin my day with white tea laced with turmeric. Turmeric latte also tastes great.